Temperature-controlled facilities (such as cold storage facilities) pose unique challenges as they are specially designed with multi-temperature rooms to accommodate a range of different temperature and humidity needs for all varieties of products. Protecting the integrity of the thermal envelope at the loading dock requires specialized dock and door products. Kelley Entrematic industrial HVLS fans produce a massive, cylindrical column of air that flows down to the floor and outward in all directions, consistently circulating air in large spaces. The gentle breeze created equates to a 4-7 degree reduction in the perceived temperature, in accordance with ASHRAE 55-2010 comfort standard, keeping employees cool and comfortable. The proper dock shelter or dock seal configuration is critical to preventing the loss of cold air during the loading and unloading process. The right dock seal or shelter will keep the elements out and temperature-controlled air inside as it fits tightly against the parked trailer. In some applications, inflatable dock shelters are the best option, as these units include fabric side and header bags that once inflated provide an effective seal around the trailer. And inflatable shelters can also be interlocked into a master control panel with other loading dock equipment. Designed to store in a vertical position completely inside the facility, vertical storing dock levelers are the preferred choice for cold storage and temperature-controlled facilities. 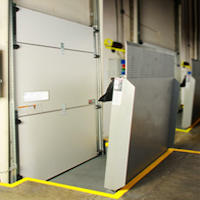 By having the dock leveler store inside the facility, the overhead door is able to close flush to the floor, eliminating air gaps typically found with pit-style dock levelers. The applications can also be configured to allow the swing-out doors on refrigerated trailers to actually open inside the facility, eliminating the mass loss of cold air that would occur if the doors had to be opened prior to backing into the loading dock. This package also helps seal the gaps that can exist once the trailer is parked against the dock bumpers and the leveler is positioned for loading and unloading. 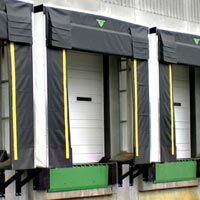 Designed specifically to be used on cold storage loading docks in conjunction with vertical dock levelers, the VertiCool door utilizes 48” high and 4” thick closed-cell XEPS foam panels, an advanced dual-compression seal system, and heavy-duty polymer tracks to provide exceptional thermal protection at the loading dock. VertiCool doors also provide a far superior lifetime cost of ownership versus conventional insulated sectional doors or vertical rise freezer doors. Having all equipment interlocked and operated in a controlled sequence prevents the kind of improper operation that could lead to a mass loss of cold air through sectional doors being opened incorrectly or remaining open.